Uranus, the seventh planet from the Sun, was probably struck by a large object at some point in its history. The collision knocked the planet sideways, giving it a most unique orbit. Unlike the other planets, whose axes are generally upright on their orbits, Uranus rotates on its side with its axis in the plane of its orbit. It takes the planet slightly more than 84 Earth years to complete one revolution around the Sun and almost 18 Earth hours to complete one rotation about its axis. Because Uranus's poles—and not its equator—face the Sun, each pole is in sunlight for 42 continuous Earth years. Uranus was discovered in 1781 by German astronomer William Herschel (1738–1822) during a survey of the stars and planets. At first, Herschel thought he had spotted a comet, but the object's orbit was not as elongated as a comet's would normally be. It was more circular, like that of a planet. Six months later, Herschel became convinced that this body was indeed a planet. The new planet was given two tentative names before astronomers decided to call it Uranus, the mythological father of Saturn. Uranus is about 1.78 billion miles (2.88 billion kilometers) from the Sun, more than twice as far from the Sun as Saturn, its closest neighbor. Thus, the discovery of Uranus doubled the known size of the solar system. Uranus is 31,800 miles (51,165 kilometers) in diameter at its equator, making it the third largest planet in the solar system (after Jupiter and Saturn). It is four times the size of Earth. Similar to Jupiter, Saturn, and Neptune, Uranus consists mostly of gas. Its pale blue-green, cloudy atmosphere is made of 83 percent hydrogen, 15 percent helium, and small amounts of methane and hydrocarbons. 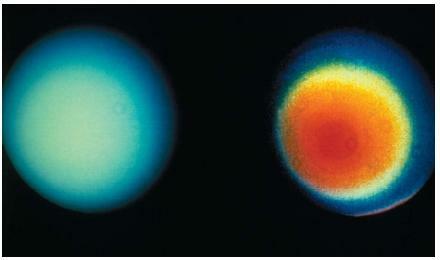 Uranus gets its color because the atmospheric methane absorbs light at the red end of the visible spectrum and reflects light at the blue end. Deep down into the planet, a slushy mixture of ice, ammonia, and methane surrounds a rocky core. Most of what is known about Uranus was discovered during the 1986 Voyager 2 mission to the planet. The Voyager 2 space probe left Earth in August 1977. It first visited Jupiter in July 1979, then Saturn in August 1981. 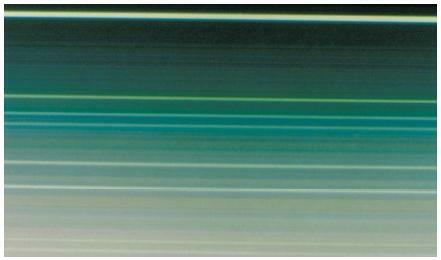 Voyager 2 collected information on Uranus during the first two months of 1986. At its closest approach, on January 24, it came within 50,600 miles (81,415 kilometers) of the planet. Among its most important findings were ten previously undiscovered moons (bringing the total to fifteen) and two new rings (bringing the total to eleven). Voyager also made the first accurate determination of Uranus's rate of rotation and found a large and unusual magnetic field. Finally, it discovered that despite greatly varying exposure to sunlight, the planet is about the same temperature all over: about −346°F (−210°C). fall into three distinct classes: the original five large ones; the eleven small, very dark inner ones uncovered by Voyager 2; and the five newly discovered much more distant ones. Voyager 2 determined that the five largest moons are made mostly of ice and rock. While some are heavily cratered and others have steep cliffs and canyons, a few are much flatter. This discovery suggests varying amounts of geologic activity on each moon, such as lava flows and the shifting of regions of lunar crust. The original nine rings of Uranus were discovered only nine years before Voyager 2 's visit. It is now known that Uranus has eleven rings plus ring fragments consisting of dust, rocky particles, and ice. The eleven rings lie between 23,500 and 31,700 miles (38,000 and 51,000 kilometers) from the planet's center. The extremely dark rings range in size from less than 1 mile to 60 miles (0.5 to 95 kilometers) wide. Was Uranus' pole facing the Sun when Voyager 2 approached in 1986?